Although traditionally a very orthodox Jewish area, in the past ten years Golders Green has received an influx of Korean and Polish residents, resulting in a handful of Polski skleps and two brilliantly-stocked Korean supermarkets. 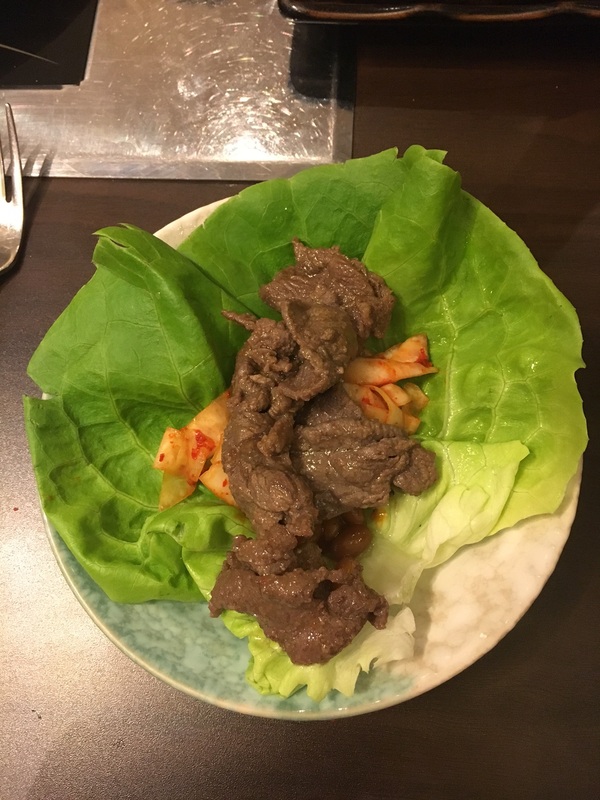 On of my earliest blog posts was about the ‘food scene’ (if it amounts to as much as that) in Golders Green, and now adding to the list I’m writing about the new Korean restaurant by Spicy Grill, a slice of Seoul on my doorstep. You know it’s a good sign when you walk into a restaurant of any foreign cuisine and all its clientele are from said cuisine’s home territory. Incredibly busy even on a Monday night, we were quickly seated at one of the tables – equipped with its own built-in barbecue, of course. Trying to work out what to order from the extensive menu, it became clear that Korean food is far more than just kimchi, although this fermented cabbage dish is everywhere. Served on the side with the big barbecues, it is also a main ingredient in Kimchi Jjigae – kimchi and tofu soup. Red hot and bubbling in temperature and bright red in colour, this arrived at our table blistering hot. I watched it simmering away while I waited the required ten minutes for it to cool to a consumable temperature. 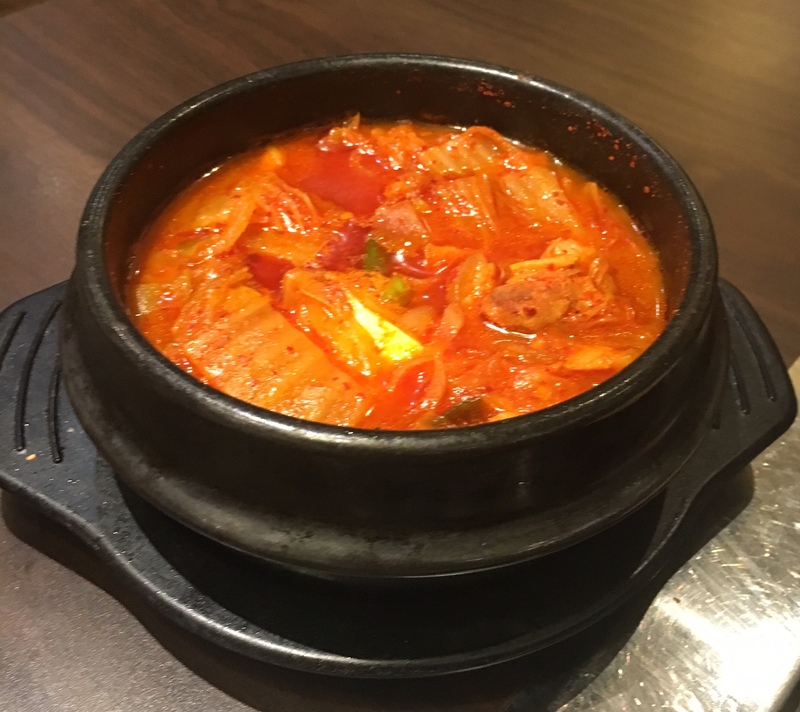 Once cool enough to actually eat, I was initially overwhelmed by the kimchi flavor – it is, after all, an enormous bowl filled with the stuff. Seasoned with gochujang, a spicy Korean chili sauce, this soup had an addictive umami kick – just the right level to hook you in for second, third and fourth spoonfuls, despite knowing that this much fermented cabbage will surely see you off to the toilet for quite a while after. The tofu was soft, with a creamy texture which calmed and complemented the fiery kimchi nicely. The options of meat available to barbecue ranged from plain jane beef right the way through to tongue – this offal lover’s dream. 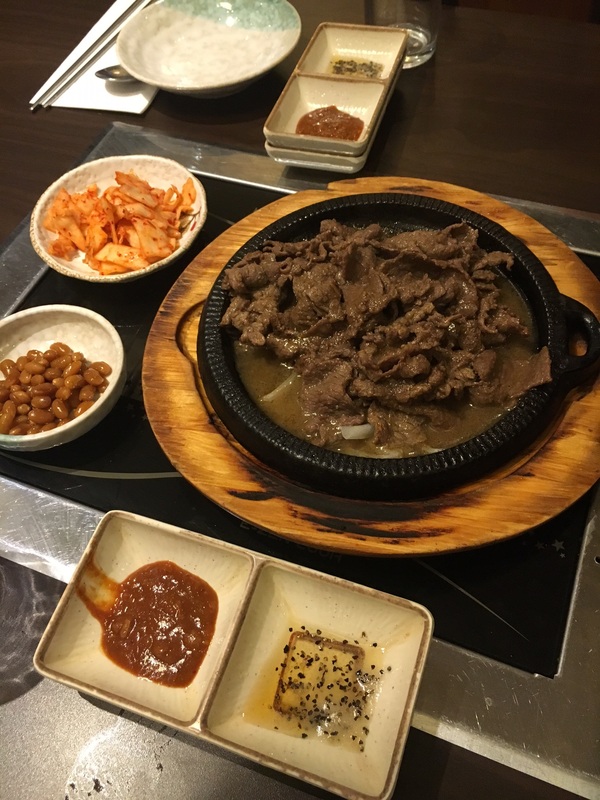 Unsuccessful in convincing my dining partner that we should try the tongue, we settled on beef bulgogi, grilled marinated strips of sirloin steak served with onions. I’m not altogether sure how I feel about going out to eat, to then have to cook my own food…seems like the work of lazy restaurant chefs to me. However in this instance, the manual labor on our side was spared; because we had ordered just one barbecue dish, it was cooked for us and brought to the table. Our beef came accompanied by sweet beans, more fermented cabbage, a sweet satay-like sauce and some sesame oil. We could then combine all this in a lettuce wrap, a genius way to mix all the flavors while keeping the meal light and fresh. The meat was soft and beautifully flavored, with a touch of sweet against the charcoaled meat. In addition to our cauldron of kimchi and vast plate of beef, my friend insisted we couldn’t miss the Korean fried chicken. 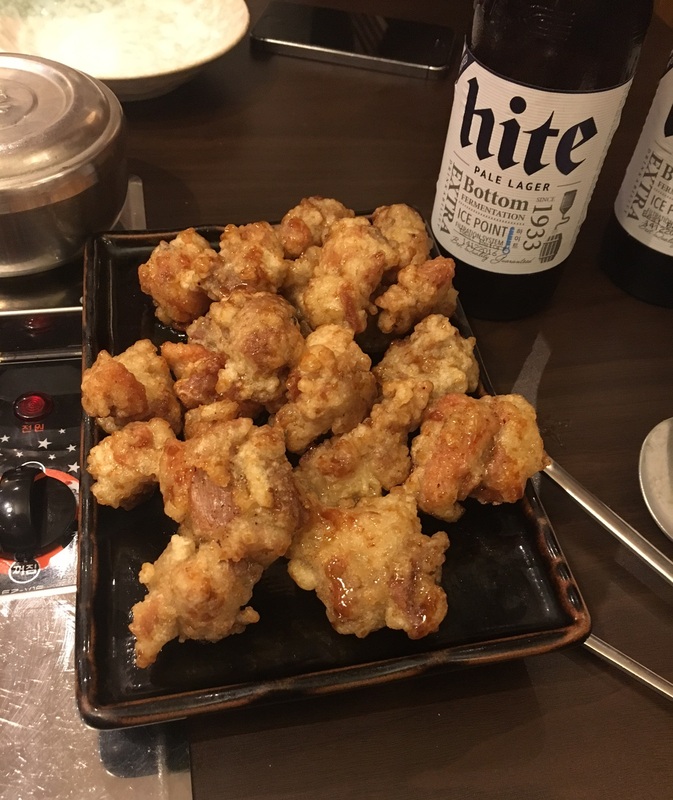 Different from the colonel’s Kentucky fried variety, Korean fried chicken is fried twice, leaving its skin doubly as crunchy but far less greasy. They tend to use younger chickens with more tender meat – in our case, the small chunks of chicken, even though they were boneless cuts of breast, stayed succulent and moist. Washed down with the extremely drinkable Hite Korean Pale Ale, this was some of the best fried chicken I’d ever tried (and I’m fairly partial to some fried birds, especially post four pints on a Saturday night). The whole meal was more than enough for the two of us, and with a beer each and service the whole meal came to £18 each. I will certainly be visiting again soon to try out more dishes on the menu, and perhaps maybe even do a bit of DIY barbecuing on the tables. I urge you all to head up to my much beloved Golders to give this place a go.